Alternatively known as the Greater Bay Area (GBA), the Big Bay Area (BBA) is a mainland China initiative to economically integrate the Pearl River Delta’s nine cities and two special administrative regions - Hong Kong, Shenzhen, Guangzhou, Zhuhai, Foshan, Zhongshan, Dongguan, Huizhou, Jiangmen, Zhaoquing and Macau. With a combined GDP of around $1.4 trillion and a population of 68 million, the plan creates a city-cluster that rivals the world’s leading international bay clusters – San Francisco, New York and Tokyo. It is anticipated the project will result in greater connectivity and encourage improved flows of transport, trade, capital and information. Key drivers to its success include innovation, technology, manufacturing, trade and finance. Cooperation between Guangdong and key cities is already well underway. With the recent opening of the world’s longest sea crossing, the Hong Kong-Zhuhai-Macau Bridge – a 55 kilometre bridge and tunnel construction, journey times from Zhuhai to Hong Kong International Airport, for example, have dropped from four hours to 45 minutes. According to Daniel Wong, director and head of Research & Analytics, Hang Seng Indexes, the development of the BBA is one of the most important government policies for China. “The resources, infrastructure, and connectivity of the area creates a very good foundation for further development,” Wong said. The BBA offers enormous opportunities to investors and companies looking to build or expand their presence in China’s markets. Hang Seng Indexes has created two distinct indexes to help asset managers capture opportunities arising from this important initiative. Getting into this market early has its obvious advantages for investors seeking to diversify their portfolios. Hang Seng Indexes kicked off the BBA series on May 21, 2018 with the launch of the Hang Seng Stock Connect Big Bay Area Composite Index (BBA Composite Index), followed by the Hang Seng Stock Connect Hong Kong Big Bay Area Index (Hong Kong BBA Index) on October 8. BBA indexes are designed to track the performance of stocks from companies whose main base of operations or headquarters are within the BBA and have at least 50% of revenues derived from mainland China, Hong Kong and/or Macau in the latest complete fiscal period. The two indexes cater to slightly different markets because some product issuers wanted to include both Stock Connect eligible Hong Kong-listed stocks and Mainland-listed A-shares, which the BBA Composite Index does. Meanwhile, the Hong Kong BBA Index focus solely on Stock Connect eligible Hong Kong-listed securities. The 66 constituent Hong Kong BBA Index is derived from the BBA Composite Index, which includes 250 companies. “We are in discussion with product issuers for using these indexes as the bases of investment products,” observed Wong. The BBA indexes provide the benefit of sector diversification. The biggest industry weighting for both indexes is financials, which accounts for around a third of each index – well below financials in the Hang Seng Index, at around 48% weighting. 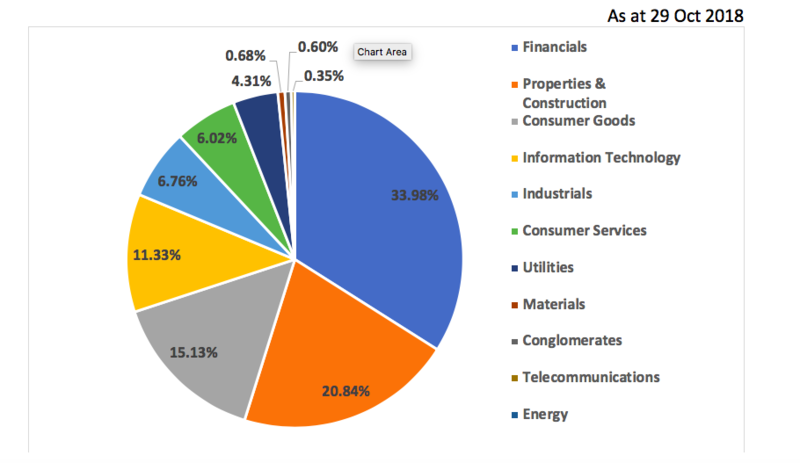 Properties & construction, and consumer goods are the second and third largest industries in the BBA Composite Index, which amount to a total of 70%. If we look into different locations in the BBA Composite Index, for example, financials and information technology are the two industries with the biggest weightings within Shenzhen-headquartered (or those whose primary centre of operations is located in Shenzhen) companies. Some big names from these industries are Tencent and PingAn. However, financials and properties & construction have the biggest weightings within Hong Kong-headquartered (or those whose primary centre of operations is located in Hong Kong) companies. Two examples are HKEX and CK Asset. This distribution is in line with these cities’ historic activities and are areas which expect more major policy support. According to the constituent weightings distribution of the BBA Composite Index, Shenzhen-headquartered companies and Hong Kong-headquartered companies have the two largest weightings, which are around 49% and 30% respectively. Wong noted that the indexes provide transparent benchmarks for investors to track the performance of companies in the BBA which are easy to understand for those seeking to invest in this dynamic growth opportunity. More information about the Hang Seng Stock Connect Big Bay Area Composite Index and the Hang Seng Stock Connect Hong Kong Big Bay Area Index is available here. Investments involve risks. Information provided herein is for information and reference only and does not constitute nor is it intended to be construed as any professional advice, offer or solicitation to deal in any of investments mentioned herein. The past performance is not indicative of future performance. Flows into Hong Kong stocks via the trading link has accelerated, while A-share investment has been tepid, amid renminbi weakening and rising demand for foreign assets. Mainland insurance firms have been granted permission to buy Hong Kong stocks via the Stock Connect, a move that should spur more southbound trading and free up QDII quota. Quantitative strategies are predicted to increase their presence on Stock Connect this year. They could benefit through their computer models' ability to process large data sets and rank China A shares accordingly. The China Securities Regulatory Commission and Securities and Futures Commission give just a week’s notice of the launch of Stock Connect, and urge participants to prepare and ensure compliance.